My best friend from high school is preparing to welcome a little man into the world pretty soon. That meant it was time for a little quilt. 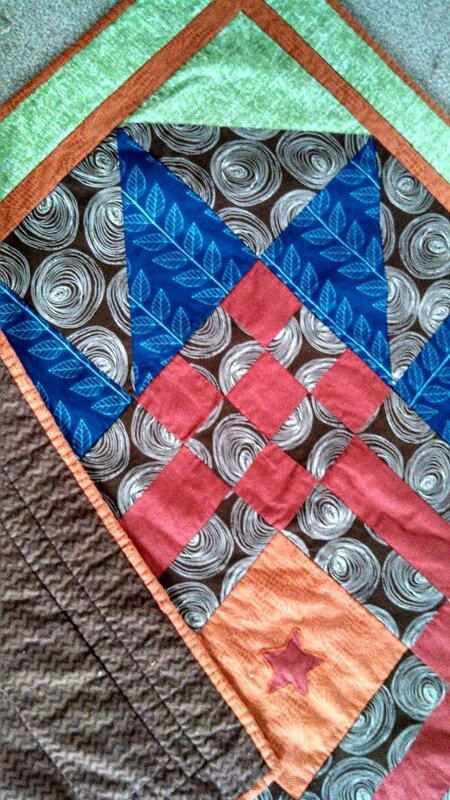 Making this quilt was pretty special for me because I had made his parents a quilt for their wedding three and a half years ago when I started to get into quilting as a longer term hobby. They use the quilt pretty much daily, so I’m excited for this one to get some use, too! 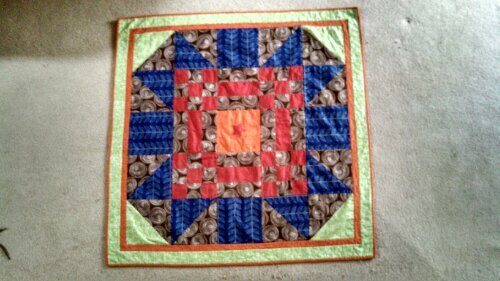 It’s also special because it’s the first boy quilt I’ve ever made. The bed set mom and dad chose had a lot of colors, but I didn’t want it to be too busy. I chose this pattern from Michelle’s Romantic Tangle and made some slight modifications. I sized it up a bit and added mitered borders to allow more room for shrinkage. It came together very quickly, but, when the top was finished, it was missing something in the center. 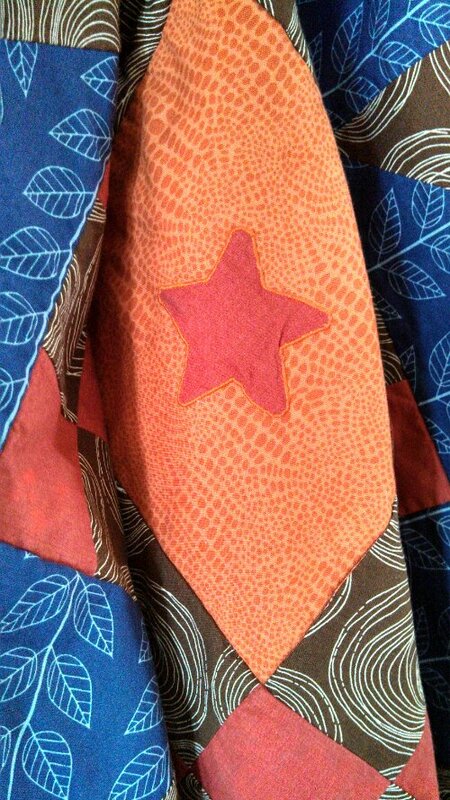 Chris had the idea to add a star, so I did my first bit of appliqué. The back is a chevron flannel and it is minimally quilted making it super soft for baby. 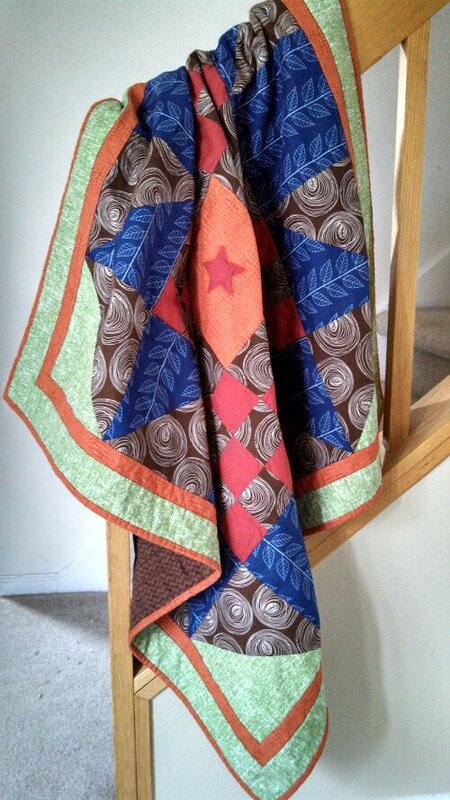 Remember the quilt for mom and dad I made over three years ago? It had been that long since I’d seen them! I was able to fix that by heading to Chicago for the shower to deliver the gift in person! That made this quilt extra special and I can’t wait to do it again to meet Little Man!